Review written by and copyright: Anthony Arrigo (13th September 2018). Back in the good ol’ glory days of VHS rentals, the films that wound up in my eager little hands were usually selected with little rhyme or reason. Cool cover art? Great, sold. I had less concern for continuity than I did with just seeing as much horror as I could, which is how I wound up seeing “Phantasm III: Lord of the Dead” (1994) before any of the others in the series. The same thing happened with “Return of the Living Dead Part II” (1988), another sequel seen before the original, which is vastly superior. This preface only serves to excuse some of the rose-colored tint on these nostalgia goggles, because while a recent reappraisal confirmed “Part II” is a pale imitation of the first go-round there are still many moments of which I am fond. Visually, director Ken Wiederhorn’s film isn’t such a slouch but in terms of character and content… it’s as rotten as its reanimated cast. The first half of this entry isn’t all bad, delivering the best moments and proving a wistful sensation of those halcyon days of youth gone past. Experiencing the film vicariously through Jesse is initially fun, with the youngster essentially operating independently since few parents are even seen. Once the outbreak hits and everyone groups together, and the comedy ensues en masse, that’s when this crypt trip starts to fester. “Return of the Living Dead” (1985) is a cult horror classic; this is a substandard sequel that, while deserving some credit for doing things differently, fails to capture the essence of what worked so well the first time around. The 1.85:1 1080p 24/fps image isn’t a massive upgrade over the old WB DVD but the additional resolution does allow for fine details in the make-up FX work to be more apparent. The colors in this film have always been a bit drab and that palette hasn’t changed much in HD. Definition never rises above average though, again, it does best the old DVD. The best aspect of the picture is the spooky atmosphere, which is conveyed well with this cleaned-up picture. Just don’t go expecting something revelatory along the lines of the release Scream Factory gave the first film. “Back to the Dead: The Effects of Return of the Living Dead Part II” (1080p) is a featurette that runs for 25 minutes and 1 second, Kenny Myers talks about his work on the first two films in this series, focusing on finding the balance between what he wanted to achieve and what Wiederhorn demanded. His comments are candid and unvarnished, making no bones about how he saw this film. “The Laughing Dead” (1080p) is an interview that runs for 19 minutes and 22 seconds, Director Ken Wiederhorn talks about his career and the film’s overt comedy. “Undead Melodies” (1080p) is an interview that runs for 12 minutes and 48 seconds, Composer J. Peter Robinson sits down for a chat regarding his score. “Interview with Troy Fromin” (1080p) interview runs for 2 minutes and 10 seconds, catch up with the opening’s stoned squad driver. 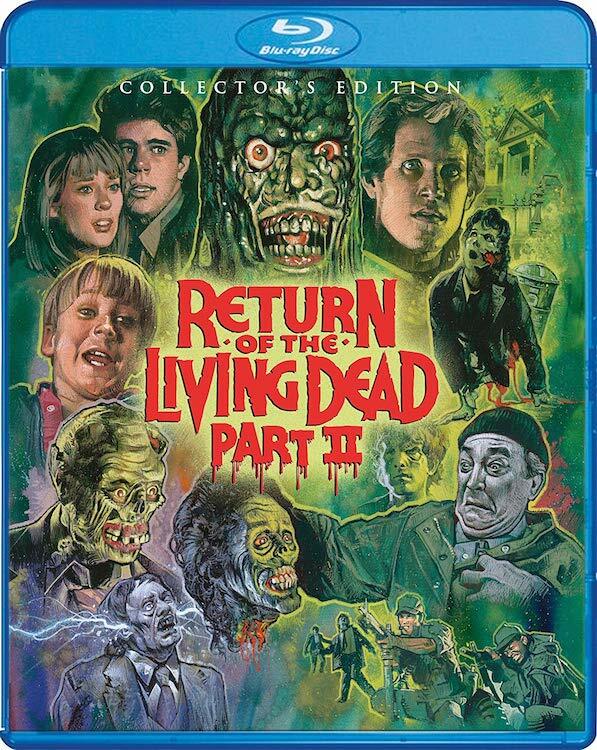 “They Won’t Stay Dead: A Look at Return of the Living Dead II” (1080p) is a featurette that runs for 29 minutes and 45 seconds, this is a scathing look back at the troubled sequel, with inflammatory quotes from a number of people connected to the project. Definitely worth a watch. “Vintage Featurette – Live from the Set” (SD) featurette runs for 5 minutes and 35 seconds, this is a goofy look at the film’s production. “Vintage Interviews” (SD) featurette runs for 2 minutes and 36 seconds, featuring a few quick words with Wiederhorn, Karen, Mathews, and Myers. “Behind the Scenes Footage” (SD) featurette runs for 4 minutes and 14 seconds, this is old camcorder footage of FX work and production outtakes. A teaser trailer (1080p) runs for 1 minute and 44 seconds. A theatrical trailer (1080p) runs for 1 minute and 41 seconds. Four TV spots (1080p) run for 2 minutes and 10 seconds. Still gallery of special effects make-up runs for 5 minutes and 59 seconds, containing 23 images, and still gallery of posters & lobby cards runs for 1 minute and 46 seconds, containing 22 images. The single disc comes housed in a standard Blu-ray keep case. The cover art is reversible. A slip-cover featuring the new art is included on first pressings. Nowhere near as fun and fresh as the first film, “II” starts off decently enough before devolving into a comedy of constant errors. The story is a weak retelling of the first’s, only saved by Elswit’s strong cinematography and a blue, foggy atmosphere that screams horror. I have a soft spot for this film and that’s probably the only thing preventing me from ripping it to complete shreds. Scream Factory, though, has issued this kinda-cult classic with a loaded edition well worth acquiring… if you’re a fan.